A rib roast or “Prime Rib” is obtained from the same cut of meat that a rib eye steak is derived, the rib section of the beef animal. However the term “Prime” is often used incorrectly in labeling cuts of meat that is actually a rib roast. Prime rib is not named after the quality grade of USDA Prime, but rather, its name is a reflection of the majority of the primal cut. Culinarily, the term “prime” refers to the highest USDA grade of beef, and is only given to the finest beef. The most notable feature of the “prime” designation is the even marbling and creamy layer of fat, and then the other factor is the age of the animal at slaughter. The primal beef rib accounts for about 10% of the total carcass weight, and consists of ribs 6 through 12 as well as a portion of the backbone. 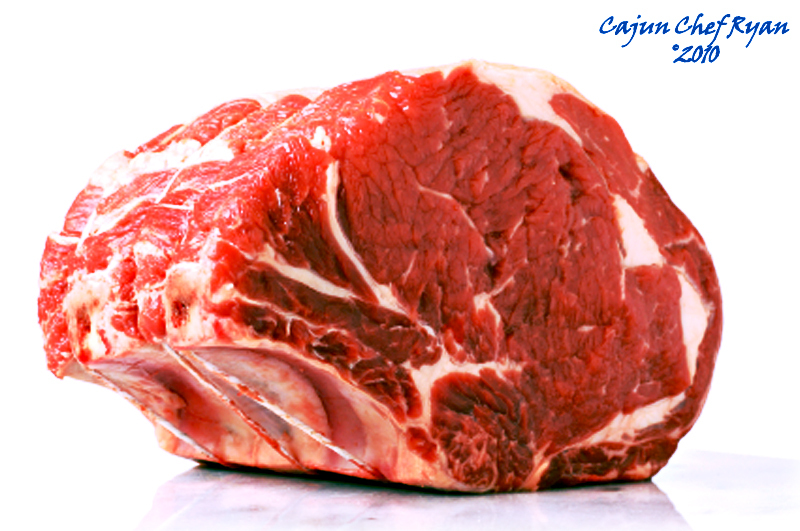 The eye meat of the rib is not a well-exercised muscle and therefore is a very tender cut of beef. The rib also contains a large amount of fat marbling compared to the rest of the beef animal carcass, therefore, producing rich, full-flavored roasts and steaks. 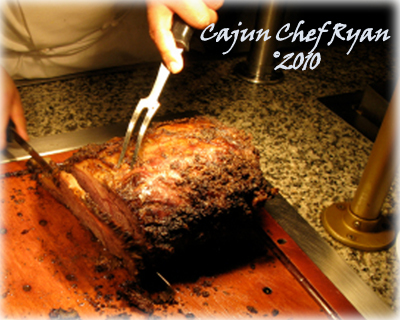 Most folks who enjoy rib roasts and "Prime Rib" typically will recognize the carving station as depicted in the image on the right. This is the typical method of serving a rib roast on buffet, and any restaurant worth their salt will also cook the rib roast early in the day, and keep them at temperature throughout the shift. Most prime rib aficionados prefer their meat cooked medium rare to rare, so it is a challenge to hold the roast at temperature without continuing to cook the meat. The setting on the holding cabinet should be 140º F, and this is optimum temperature for holding a roast for extended periods. I learned this recipe years ago by an old colleague of mine, Chef Paul Prudhomme. A few notes about this recipe: 1.) If you don’t have a commercial hood vent or exhaust fan system over your indoor kitchen stove, oven, or griddle, this dish may smoke you out of the kitchen. But it’s worth it! Moreover, you can also cook it outdoors on a gas grill; a charcoal fire does not get hot enough to "blacken" the steak properly. If you have a smoke detector in your house, you will be able to determine if it is working correctly. This is NOT a dish to prepare in an apartment building with a central fire alarm system wired into your smoke detector. It causes great excitement! Also, you can be guaranteed you will meet your landlord. 2.) Be sure to read the entire preparation steps once before even attempting this recipe, it takes more than a day to prepare. 1. Remove fat cap off top of meat (a butcher can do this for you) and reserve for later use. Place the roast, standing on the rib bones, in a very large roasting pan. Then with a knife make several dozen punctures through the silver skin so seasoning can permeate meat. 2. Pour a very generous, even layer of black pepper over the top of the meat (the pepper should completely cover it); repeat with the garlic powder, then the salt, totally covering the preceding layer. Carefully arrange the onions in an even layer on top so as not to knock off the seasoning. Place the fat cap back on top. Refrigerate 24 hours. 3. When ready to cook the rib roast, preheat the oven to 550º F, and roast until the fat is dark brown and crispy on top, about 35 to 45 minutes. Remove from oven and cool slightly. Refrigerate until well chilled or at least 3 hours. This is done so the juices will solidify and the steaks can be cooked rare. 4. Remove the fat cap and discard. With the blade of a large knife, scrape off the onions and as much of the seasonings as possible and discard. Then with a long knife, slice between ribs into 6 steaks (4 will have bones); trim the cooked surface of meat from the 2 pieces that were on the outside of the roast. Season and cook in your favorite way for steaks. 5. TO CAJUN BLACKEN THE RIB STEAKS: Sprinkle the steaks generously and evenly on both sides with the Cajun Spice blend, or about 4 teaspoons for each steak and pressing it in with your hands. 6. Heat a cast iron skillet over a very high heat until it is beyond the smoking stage and you see white ash on the bottom of the skillet, or at least 10 minutes, the skillet cannot be too hot for this method. 7. Place one steak in the hot skillet (cook only one side at a time) and cook over a very high heat until the underside starts to develop a heavy, black crust, about 3 to 4 minutes. Turn the steak over and cook until the underside is crusted like the first, about 3 to 4 minutes more. Repeat with the remaining steaks. 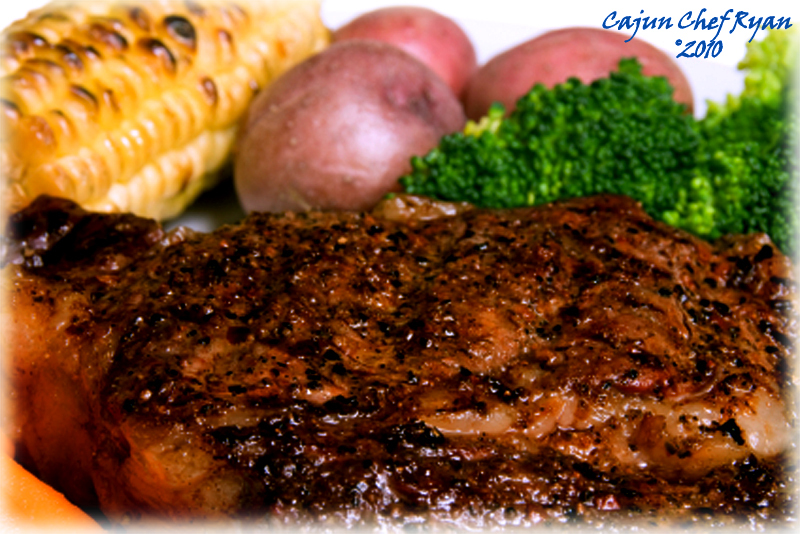 To Serve: Serve each steak while piping hot along with a side of grilled corn, boiled Cajun new potatoes, and broccoli (optional). You will love it, just be sure to do it outside on the gas grill with your cast iron skillet, else you will have smoke alarms going off for an hour. Chef Prudhomme is a master when it comes to concocting mixes of spices and I’m not talking about the bottled ones in the store – every recipe I have seen of his pretty much always start with a blend of spices, such an important part of laying on flavor – blackening is an art and you have explained in beautifully … too many times blackening was used as a novelty catch all, not what it was intended as flavoring… as I said before, there is a difference in blackening and burnt…. Indeed that steak does look awesome alongside the roasted vegetables…. I look forward to giving this meal a shot! It looks gorgeous but I must confess I am a little nervous of being smoked out of the kitchen! I will keep it mind if I ever work up the courage. You are so right, there is a difference between being burnt and blackened. And Cajun spices are more about flavoring than making it all about heat and hot too much that it burns the tongue. I was just considering going vegetarian…… FORGET that! I am making Cajun Blackened Prime Rib Roast! That looks amazing! That big rib steak just made me drool! Yum Yum! That looks AMAZING! I bit the taste is great too. There’s nothing better than a prime rib roast! I love fresh meat with veggies! An excellent post Chef, but I do think this can be cooked on SOME charcoal grills. I can easily get my Big Green Egg to temps of 750f and I know others take it hotter. The trick would just be using lump coal and having a set up that will have the cast iron griddle immediately above the coals. I look forward to trying this one. I have only blackened pork chops so far and they were excellent. Its 7:36 in the morning and the title of this post alone has me salivating. I will be trying this one soon. ::sigh:: I wish I could afford this. I’ve been wanting to make a rib roast for years. This one looks amazing. I wish I could just stand there and smell it. Wow. I know what you mean about cooking these wonderful pieces indoors, and I must cook one of these again outdoors on my new BBQ. This looks wonderful Chef. I love blackened prime rib but haven’t had it in years. Yours looks beautiful and makes me want to attempt my own!